Pre-Amplifier: Built-in Max 4*49W BTL Amplifier with RMS 4*29W (Vcc=14.4v,THD=10%); It can drive both 4Ω & 2Ω door speakers! Be aware that only emphasizing higher max power out does not make any sense, as RMS power out is the most acceptable and practical indicator (non-distorted) to tell its max performance for daily listening! WiFi/Microphone: All ATOTO A6 series have builtin microphone & Ultra external Wi-Fi antenna (Silver plated copper wire). For ATOTO A6 Premium / Pro version, external microphone is also provided! All ATOTO A6 series use latest builtin MEMS microphone so that the phone call quality can match up with some factory car microphones! Safe driving has been one of the top concerns for every driver. Some old cars do not have factory steering wheel audio control feature, or keys for quick controlling are less, and even there are buttons on the left/bottom of the car stereo, it is still unsafe in certain cases. 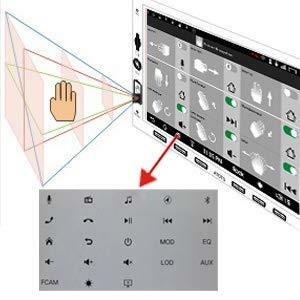 Certain vehicles may not be qualified for installing the ATOTO A6 Pro that comes with gesture sensor feature, due to the facts that: 1). Some installation mounting kit may have a concave double din opening, which might (partially) block the IR light from casting to form a complete pyramid-shaped operation area, and certain gestures may not be recognized successfully; 2). For certain vehicles, the operation of turning the steering wheel may cause the hands to go through the gesture operation area, or the operation of turning on wiper controller may also cause the same effect, and the system responds/reacts unexpectedly. Please kindly read the document "ATOTO A6 Pro Gesture Sensor Installation Requirements" for more information before making decision. More than 300 apps from Google Play Store have been tested installable on ATOTO A6 Series. Thanks to Ultra external Wi-Fi antenna (Silver plated copper wire), WiFi reception has been significantly improved, and the reception of ATOTO WiFi can be comparable to some smartphones! Phone battery power may drop quickly, especially when it is streaming audio via Bluetooth, or sharing phone data (WiFi hot spot or BT Tethering) for Android car stereo to access internet, or running EasyConnect app wirelessly. 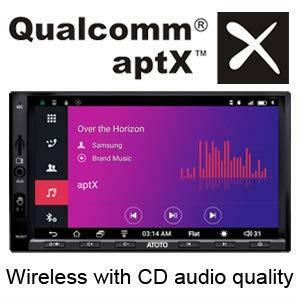 Powered by inner PMS IC, ATOTO A6 Premium/Pro can deliver power to smartphone faster than other Android car stereos (500mA - 600mA). Max charging speed is determined by charging protocol from phone, & length or materials of the charging cable. Users can find the availability of firmware update notification from ATOTO AOCSS. Login AOCSS to learn more.